When you join in the Globe Santa holiday tradition, your donation makes a positive impact on the lives of local families in need. All donations go directly to support Globe Santa, a program of the Boston Globe Foundation. The majority of our donations come from individuals, families and organizations within the community, giving what they can to help those in need. That’s what Globe Santa means when it says, “Give a little. Help a lot.” Small donations make a BIG difference by brightening the life of a child. Make an online contribution. It’s fast, simple and secure! Does your company offer a Matching Gifts program? If so, you may be eligible to double your donation to Globe Santa! Click here to learn more. If you don’t see your company name listed here, ask your human resources department to contact Globe Santa. The Globe Santa Fund has been recognized by the Internal Revenue Service as a non-profit public charity under Section 501(c)(3) of the Internal Revenue Code. Contributions to the Globe Santa Fund are tax-deductible to the extent permitted by law. Federal Identification Number is 04-2731195. Make checks payable to "Globe Santa"
Use your American Express Gift Points. Click here to learn more. Volunteers help Globe Santa raise funds at events, activities and donation drives throughout the year. You can give anything from a few hours to a weekly commitment of your time. View our Ways to Help page to learn how you can help local children. 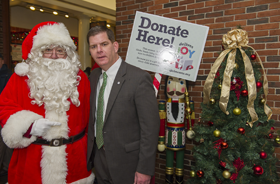 During the holiday season, The Boston Globe publishes lists of those who have donated to Globe Santa. Donations can be made as a Friend of Santa, in memory of another or anonymously. Search for donation as it appeared in the newspaper. Globe Santa strives to deliver gifts to as many local families in our coverage area as possible. Follow the links below to see the scope of this charity, the generosity of contributors, and the impact of donations on the community.